Hi friends! Has spring arrived where you live yet? The temperatures here in NY are slowly climbing and I couldn’t be more excited. 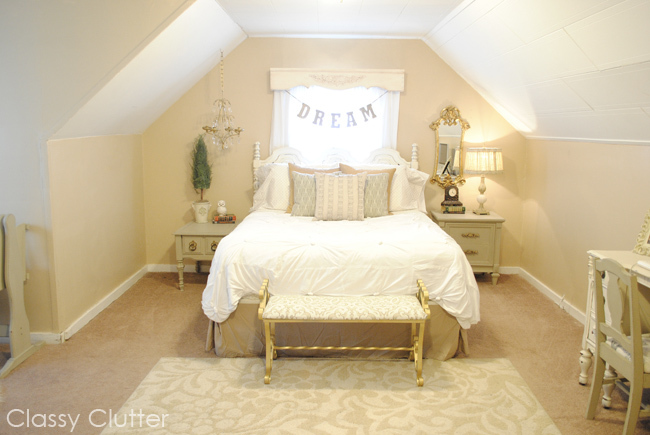 Anyway, the last few months I have been working slowly on my master bedroom redo. If you have been around here a while, you may notice that this room used to be my boys’ airplane room (find that post here). I had a bunch of reasons to switch the two bedrooms around but I won’t bore with all of that. I also had to re-do my boys’ room to accommodate the new bedroom and new baby brother so I will show you that makeover really soon. Here is the view right as you come up the stairs. 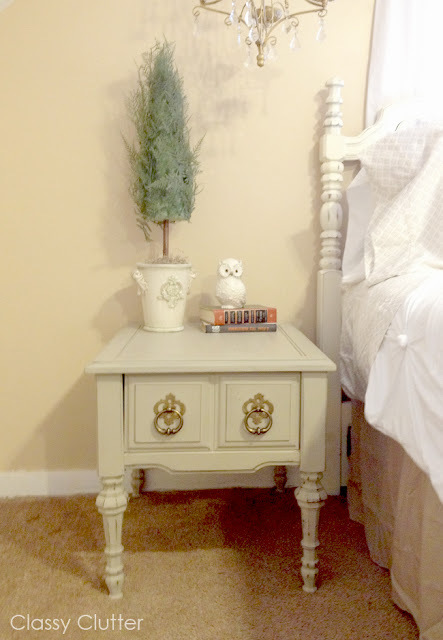 You may remember my chalk paint desk makeover (on the right), you can see that post here. I also recovered my little swirly bench to match the bedroom. 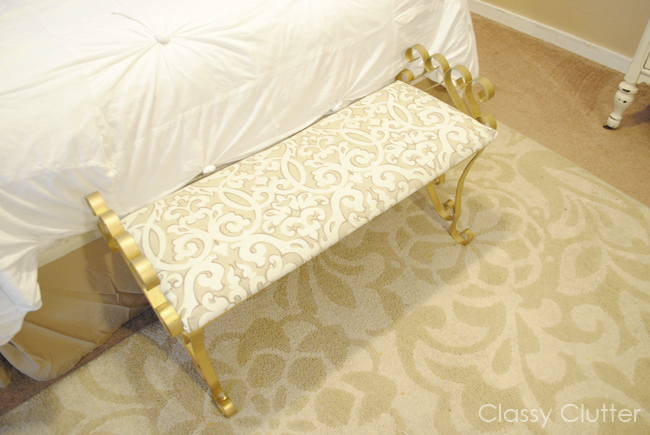 I have always wanted a little bench at the end of the bed… not sure why but now I have it! Yay! The rug used to live in my living room but recently got replaced. The rug is from Home Depot. 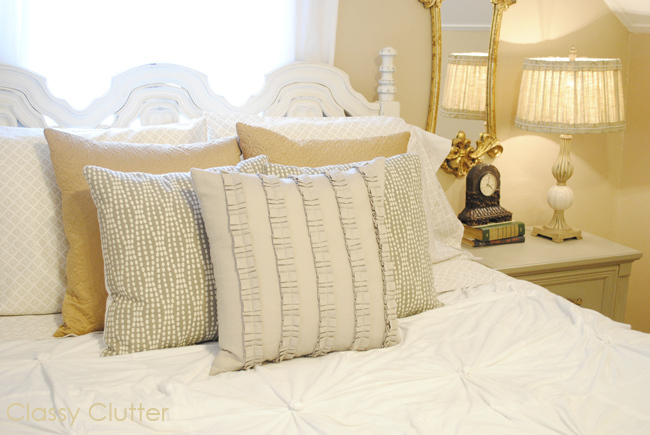 The gold pillows and grey ruffled pillow came from HomeGoods and I made the grey geometric pillows. The fabric is from Joanns. 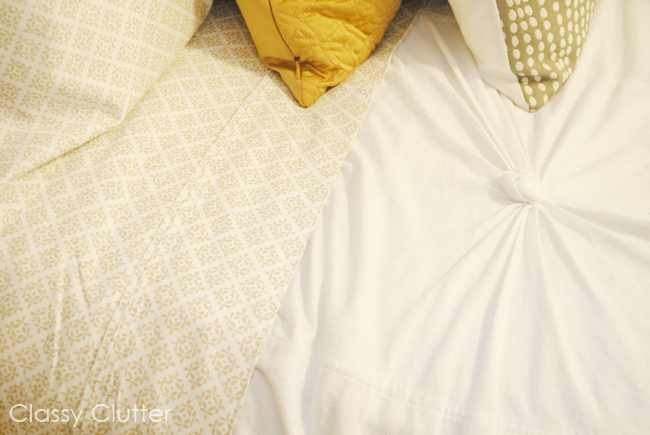 You can find my Anthro inspired knotted quilt tutorial here. 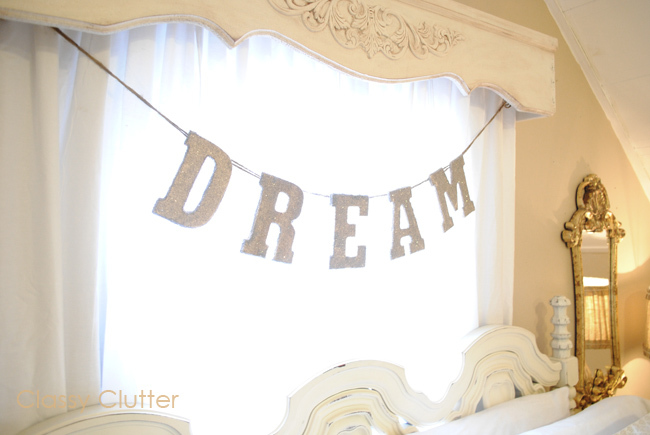 I made this DREAM banner using Savannah’s tutorial to make this German Glitter Glass banner. You can also learn how to make your own window cornice here. This side is “my side” of the bed. The mirror and lamp are from Hobby Lobby and the clock and books are thrift store finds. You may recognize the nightstand that was mustard yellow in it’s last life! I love the new grey and gold. Here’s “his side” of the bed. I made the little topiary and the owl was a gift from my friend. Cute huh? The sheets are from Target and I believe they’re from the Nate Berkus collection. Here’s the view of the little Nursery nook for my newborn baby Tanner. It is SO nice to have this little space for him in our bedroom while he is so tiny! Here’s one last look at the whole room. 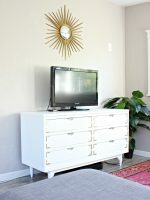 I’ll show you the dresser (on the bottom left of this photo) makeover soon too! Do you like it!? We really love it! Looks wonderful! Your bench cover couldn’t have matched the rug any better! Great job!! so pretty! love the gold mirror on “your side” and the owl on “his side”. Oh, and the bench!! It looks AMAZING!! Everything came together beautifully! 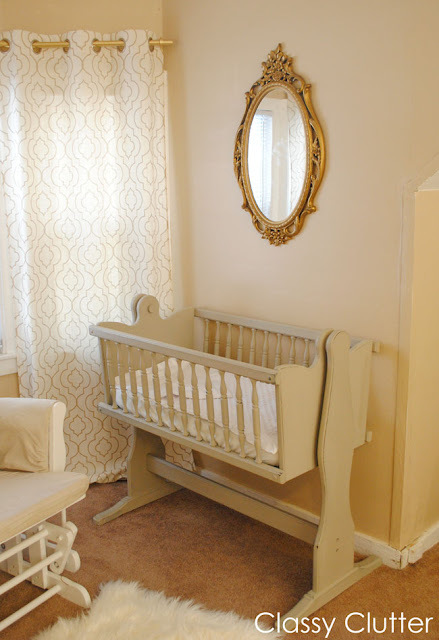 I adore the nursery corner for baby Tanner, precious!! Awesome job Mallory! It looks like a fancy hotel in there…what a peaceful and soothing retreat! Great job! Beautiful room! Love all the details and those mirrors are gorgeous. Spring is having a hard time in Florida too. Such a beautiful, peaceful room! OMG ! I love your bedroom. Goregous and dreamy. I adore the baby nook of coziness ! You have done an excellent job. 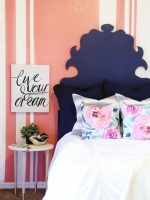 I am in the process of planning to redecorate my bedroom so I have seeing others ideas and choose of colors. Thank you for sharing. Such a gorgeous bedroom! I love it! I LOVE it! 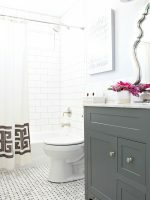 We just finished our master makeover too, and there are similar white and fresh feelings! Looks great! I not only like your redone room I really love it. Looks so cozy, comfy. Like your own little private spot in your home. It’s big enough but not too big. The little nook for your new baby is so cute, what a great spot to be able to be with him but still have your own “space”. I think it’s great you can look around your room and see all the personal things you’ve made for your room. Happy Easter and Spring. Congrats on your new little boy. Such a wonderful time in all your lives. What a dreamy bedroom! I love the white linens and all the decor. 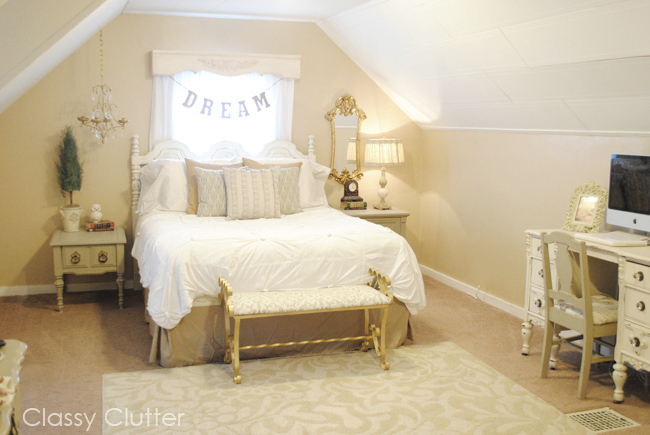 That baby bassinet is adorable. Visiting from someday crafts. I’m in love with the little nursery nook you’ve got in your room. So much nicer than having those tiny littles so far away in another room. Thanks for linking up at Whatever Goes Wednesday! Love the designer look but how much was the designer budget? I LOVE it! It’s super gorgeous. Does the gentleman on HIS side mind all the prettiness? I really like the baby nook, really well done and the perfect space for it too. Beautiful retreat, I’m a fan all things white. I love your use of all the neutral patterns and the baby nook is adorable. 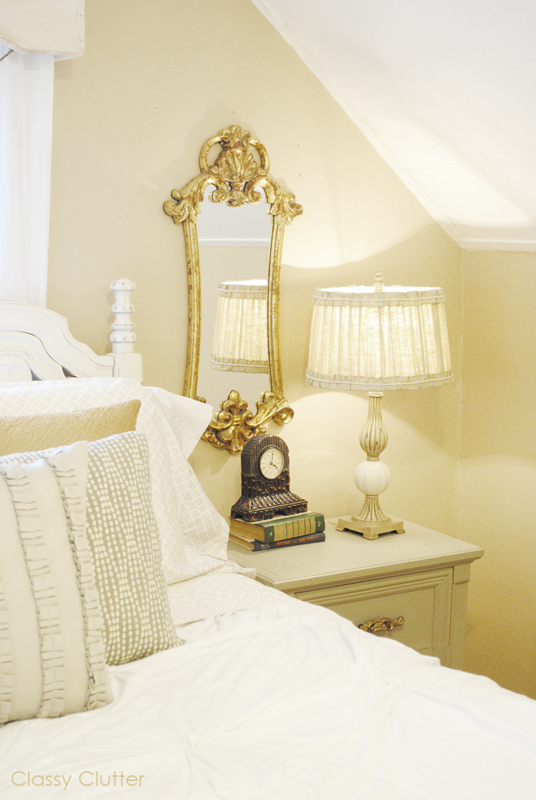 mm amazing bedroom of my dream! I would like to buy Web hosting from elcoplanet.com have any of you heard about http://www.elcoplanet.com ? I can see that they have pretty much cheap prices. Beautiful !! I love the color theme too !! How beautiful!!! 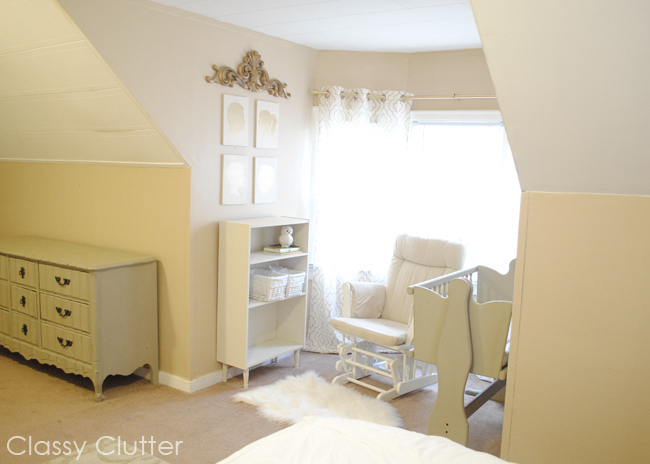 Love the nursery nook and the whole bedroom! Looks like such a peaceful and calming space! Beautiful! What paint did you use? I am doing a den/library/ballet studio in my new home and am trying to convince my husband of the merits of gold. I think he would much prefer the subtle tone of your wall to my first inclination.